Once a favourite haunt of Charles Dickens, this historic pub was built in 1663 and even features an old smuggling tunnel leading down to the River Thames! Unfortunately there is limited information on how it managed to escape the Great Fire, especially curious as the pub is located just a few streets away from Pudding Lane. 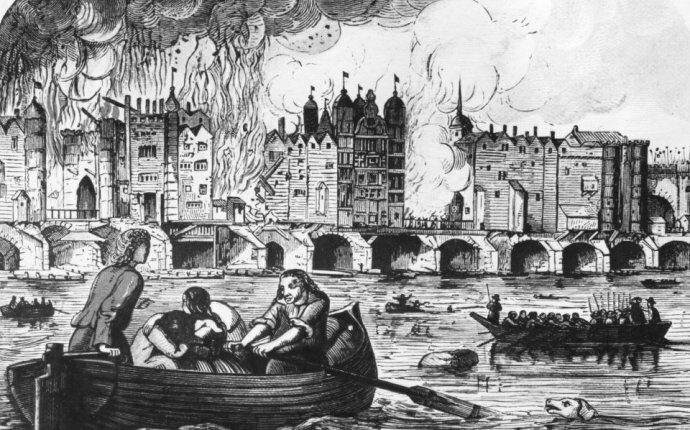 The Seven Stars was located just beyond the western limit of the Great Fire and therefore managed to escape with just a scorch mark or two. Although the inn has been through numerous renovations throughout its 400 year history, it is still full of character and charm. This historic townhouse was shielded from the fire by the priory walls of nearby St Bartholomew's. Although this timber framed building dates back to the 16th century, the stonework below it is part of the original nave of St Bartholowmew's Priory from the 1200s. Much like 41 Cloth Fair, the structure was protected from the Great Fire by the large priory walls, although during the Georgian era the timber facade was covered by modern frontage. It was only during World War 1 bomb damage that the original gatehouse was rediscovered, and it was restored to its present glory in 1932. Having only just escaped the Great Fire by a few metres, Staple Inn stood intact until a Luftwaffe bombing in 1944 which damaged some of the structure. Due to its historic value it was subsequently restored, and is now a listed building and home to the Institute of Actuaries. The Guildhall did not escape the Great Fire unscathed; a large restoration project began in 1670 during which the entire roof had to be reconstructed from scratch. Even so, the majority of the building is still as it would have been during the 15th century. As a side note, if you're visiting the area be sure to look out for the old Roman amphitheatre which is on display in the Guildhall's basement. Presumably surviving the Great Fire of London through its sturdy stone structure, St Andrew Undershaft also avoided any significant bomb damage during World War Two. Unfortunately it was damaged by an IRA attack in 1992 which destroyed its fantastic medieval stained-glass windows. The church was gutted during World War Two, but was reconstructed using the original plans from 1545. Although the church was damaged during the Great Fire of London, enough of the structure remained to provide a temporary 'soup kitchen' to the local workers who were rebuilding the city. Protected from the fire by its large curtain walls, the White Tower was completely untouched by the flames. Much like the houses on Cloth Fair, Long Lane was protected from the flames of 1666 by the priory walls of St Bartholomew's. The two remaining 16th century structures are now at number 74 and 75, although their facades date from the Victorian and Georgian eras respectively. Although the exact date of its construction is unknown, it is thought that the Hoop and Grapes was built in the late 1500s and avoided the Great Fire of London by being situated in the relatively untouched north-eastern corner of the City limits. The two buildings adjacent to the pub are also pre-1666 survivors.